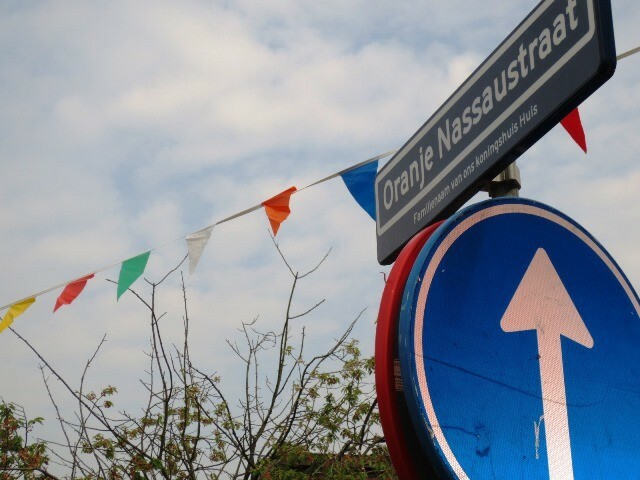 Word of the Day: KONINGSDAG, King’s Day – Welcome to the Direct Dutch institute, The Hague. Saturday 26th April, we celebrate King’s Day. As every international living in the Netherlands will know by now, King’s Day is the feast of King Willem-Alexander’s birthday. However, since the King’s birthday, 27th April, falls on a Sunday this year, and because Sunday is a Holy Day for many devout Dutchmen and women, we have advanced our national holiday to Saturday this year. But don’t wait for Saturday. Gear yourselves up for Friday night! In the centre of The Hague the celebrations will start the night before King’s Day. Don’t miss the fourth edition of the annual LIFE I LIVE Festival on Friday, 25 April. This free Festival is an excitingly new event with music ranging from pop to jazz, from blues to indie rock, from country to hip hop. A festival with high-profile names for conscious music lovers from all over the world. There is some confusion about the spelling of KONINGSDAG. Before the Dutch government called our national holiday KONINGSDAG it was known as ‘Koninginnedag’ (Queen’s Day). In fact we only had ‘Koninginnedagen’ from 1890 (when Wilhelmina started her reign) to 2013 (when Queen Beatrix abdicated). And from 1885 to 1890 the day was called ‘Prinsessedag’ (Princess’s Day). d. ‘koningsdag’ (because all combinations with ‘koning’ are with a connecting ‘s’, for instance ‘koningshuis’ (royal house) and last year’s infamous ‘koningslied’ (king’s song)? Well, the correct answer is ‘d’. The official word is KONINGSDAG. When Wilhelmina abdicated 1948, the holiday was moved from 31 August to Queen Juliana’s birthday on 30 April. Queen Beatrix kept the celebration on 30 April after 1980 because her actual birthday fell on 31 January, which was usually a cold and sinister day. Juliana celebrated her birthday at home in her palace at Soestdijk. Lots of Dutch people from all over the country flocked together to form a long parade in order to present ‘the people’s queen’ with flowers and all kinds of presents like home-made gingerbread or pieces of embroidery. From 1950 on, many people stayed at home to watch this spectacle on television. This parade was stopped in 1980 when Queen Beatrix came to the throne. Instead of inviting her subjects to her home palace (situated in The Hague), the new queen decided to visit two towns for Koninginnedag celebrations each year. These celebrations consisted of demonstrations of local crafts and customs to the royal family. Very often they took part in the festivities. Many people speak disparagingly of these festivities where the members of the royal family usually join in some variant of the game of ‘koekhappen’ (bite-the-cake). Rumour has it that our new King and Queen are fed up with these silly folkloristic (oubollige) games and are sneakily setting out a new course. Maybe we can get an idea where this new course will lead to when they visit the towns of Amstelveen en De Rijp. Whatever you decide to do, whether you have a calm and easy day at home or a wild night and day out, we wish you a lot of fun. And don’t forget to bring your button ‘Spreek Nederlands! Met mij!’ These days will give you lots of opportunities to practise your Dutch. For more information about events in and around The Hague read this newsletter! Zing Nederlands met ons! Papegaaitje leef je nog?